Bulletproof webinars are what we are aiming for, but you might experience some bumps on the road. The live streaming experience is defined by so many factors: software (us), internet speed, bandwidth stability, network security, computer knowledge, software knowledge, etc. In this article, we will show you how to deal with every potential issue. Reminder: The host will present the webinar, only s/he can start or end a webinar. A contributor will manage the room or/and join the webinar before it starts for preparation. Learn more here. Have a minimum bandwidth of 15MBs download and at least 5Mbs in upload. Your connection speed is not the only factor. You have to also look for connection stability aka the number of people connected to that same connection. The connection stability will impact the number of packets lost during a live session. Therefore, try to use Ethernet over Wifi and ask your team to not saturate the network. You must use Google Chrome to share your webcam and screen. The same goes for anyone that you invite on stage to share their screen, webcam, or audio. 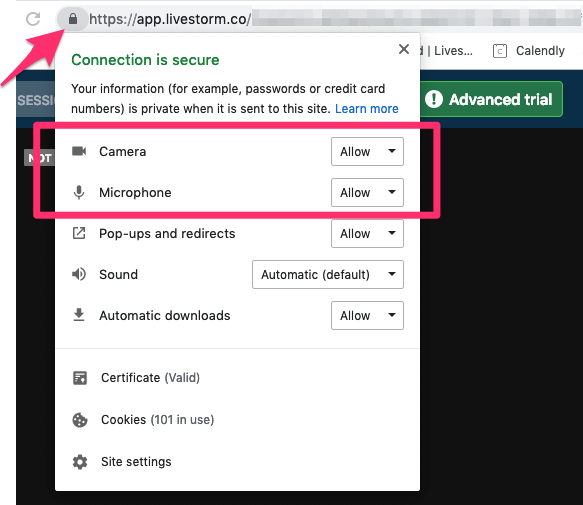 Check your microphone and webcam on your browser settings. We also prompt a modal the first time you enter the room to check your devices. Tip: Make sure the white border around your avatar in the webinar room is moving when you talk. It means that we are capturing the sound. Have a proper screen size to have a legible video (above 1280 pixels wide). Livestorm is responsive on mobile devices but the experience is always better on a regular screen. If possible, do not watch a webinar on a protected network. If your network is protected by a restrictive firewall, you will fall back t o compatibility mode (see below). Use this platform to test your network. If "Media Server" is in red then you are in a secure network behind a firewall. You can also send us the results. To fix this problem: change network, turn off the firewall or share your 4G network. When in the webinar room, click "Help" or "Encountering issues with audio or video?" What is the "Compatibility mode"? The compatibility mode ensures that you get the audio and video on any network, device or browser. It's automatically turned on if we detect an old browser or non-compatible browser or device. You are using old or non-compatible browser such as IE11, Edge or Safari. You are on a mobile device. You will not be able to be invited on stage. Attendees will experience a 15 second delay (between what really happens and what your attendees actually see). How to solve any echo? If you are in the same room as the host make sure everyone wears earphones. Otherwise, the sound will go out of your speakers and come back to the host's microphone. This is called a Larsen effect. How Do I Dial into a Webinar?